In addition to the ever-popular RAV4, Toyota engineers have been busy behind the scenes designing and testing a new compact SUV: the C-HR. 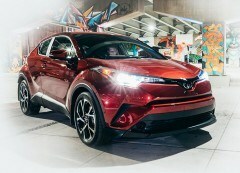 C-HR stands for Coupe High Rider, and this glowing coupe is styled to appeal to any age group. C-HR stands for Coupe High Rider, and this glowing coupe is styled to appeal to any age group. The first thing you might notice about the new C-HR is its stance. It simply demands attention and it will immediately turn heads with its futuristic and aggressive appearance complete with dramatic, overstated wheel wells and wrap around headlamps. Even the solid body lines will give you the impression that it’s not afraid to go anywhere and this SUV proves it by matching its stance with performance and offering a 4WD package as part of its lineup. In the driver’s cockpit, everything has been designed to put all of your controls easily within your reach and the 7-inch infotainment centre is quickly accessible and right in front of you. Materials that surround you are soft-to-the touch for a pleasant sensory experience. There are no signs of hard handles or sharp corners. But what about performance? In its prototype stage, the C-HR was thoroughly run through its paces by Toyota on the winding roads and high-speed highways of Europe. It was even tested at Germany’s Nürburgring race circuit to see what it would do and at the time it received, excellent marks in responsive handling and the engineers continued to develop its driving dynamics from there. Ultimately C-HR has been outfitted with a gasoline fuelled 2.0-litre four cylinder that is capable of producing 144 horses with 139 lb-ft of torque. You can choose which driving mode you would like, and the Sport Mode offers a sporty ride as you shift through simulated 7-speed sequential Shiftmatic transmission. It offers a higher engine speed as it boosts acceleration. Toyota made their Safety Sense suite standard on this model, and that means it is equipped with the latest technology when it comes to keeping you and your passengers out of danger. It includes such features like adaptive cruise control that will adjust your cruise control speed if you happen to come upon a slower vehicle in front of you and lane departure warning that alerts you if it feels you shifting from your lane without a signal. Other safety features include park assist and pre-collision warning. C-HR is available in two model options and each model expands upon high tech options and other convenience packages. Both come standard with heated bucket seats, dual zone climate control for a comfortable environment for everyone and the 7-inch audio display. When you upgrade to the XLE Premium package, you get the benefit of more safety features like a blind spot monitor, rear cross traffic alert and auto fold heated side mirrors. The XLE comes with 17-inch alloy wheels, while the XLE Premium has 18-inch alloys. Once you see this new compact coupe SUV, you are going to want to take it out for a test drive. We cannot wait to show you all of its features and think you will agree with the automotive writers that this is a “polarising design”.